Ne14 Design has worked with a number of reflexologists over the years creating custom logos and marketing materials for their reflexology businesses. We are now offering a cheaper alternative for those of you on a tight budget; customizable business card templates with our printing buddies at Zazzle - just follow the link at the bottom of this page to see our full range of designs. 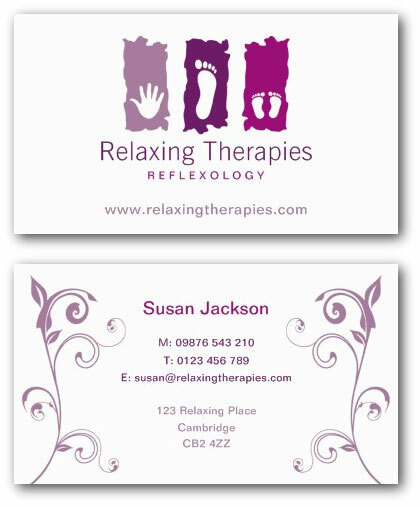 This stylish reflexology business card uses a logo with symbols of a hand, a foot and a pair of baby feet to represent reflexology and on the back of the card there are stylish leaf flourishes. This reflexologist business card uses a heart-shaped logo to represent caring and healing with toes on top to symbolise feet. 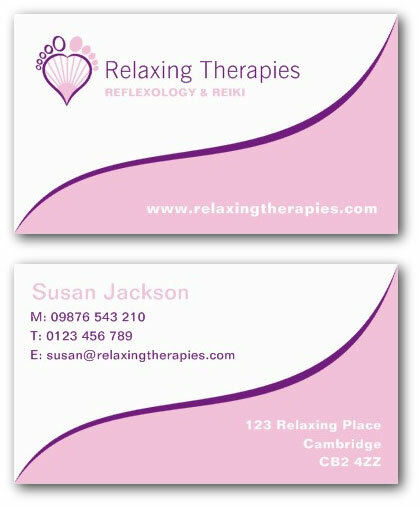 This contemporary reflexology business card uses a stylish foot logo in pink and purple with spirals representing massaging zones on the feet.